White Christmas is one of my favorite Christmas movies. I would watch it with my Mom when I was little, and I always have to watch it at least once every year. I love classic old movies like that, with the women all elegant in their fancy dresses and the spectacle of it all. I am not always a musical person, but the songs from this movie are classics that I enjoy because they remind me of when I was little and my parents used to play them around this time of the year. Hopefully this year in Minnesota we will have our own white Christmas, with just the right amount of snow on the ground. It is looking a little brown right now, so more snow by Christmas would be nice so I can go skiing! 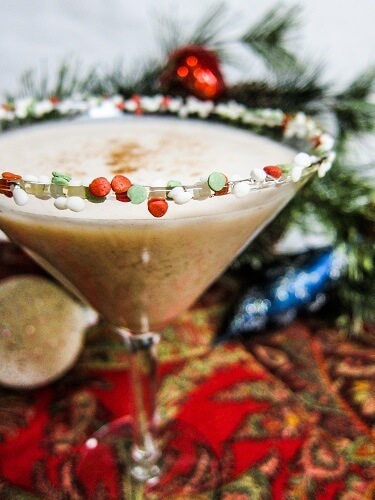 A few years back, when we had no snow for Christmas and it was brown outside, I created my own "White Christmas" in the form of a delicious drink. It is kind of like eggnog, only I didn't go buy a carton at the store and just add some liquor to it, I created my own martini instead. It is my own twist on the classic made creamy with coconut milk, spiced with a dash of cinnamon and nutmeg and scented with vanilla and almond. This has become something that I make at least once a year around the Holidays. People like different types of liquor in their eggnog, but I skip the rum and do a combination of cognac and bourbon which is what I usually have on hand. 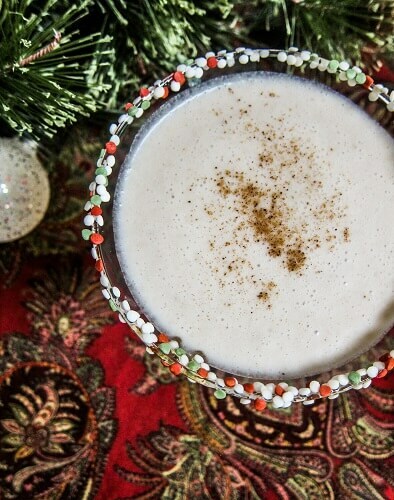 It is some of the best eggnog I have ever had (if you can really call it that because it is technically not eggnog, but it is my blog so I will). It is smooth and boozy but also contains light and beautiful flavors thanks to the vanilla and almond. I garnish it with some sprinkles because I can and I just can't resist being festive! It tastes like Christmas! Whether you have snow on the ground where you live or not, you deserve to enjoy one of these, kick back and forget about Holiday stress, and you should totally make yourself one. Cheers! To make rim, Spread sprinkles out on a small plate. Coat the rim of the martini glass with the syrup by dipping it into it on a plate, then dip the syrup coated rim into the sprinkles and set aside. 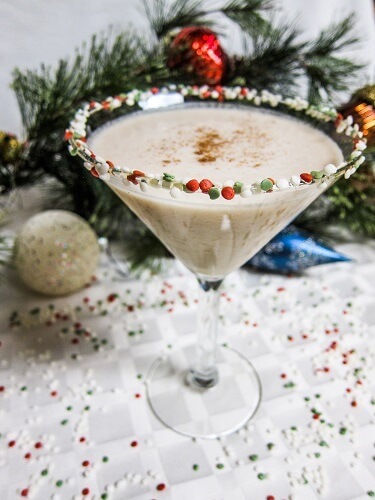 In a martini shaker add the ice, vanilla, almond extract, liquors, vanilla bean syrup, coconut milk, cinnamon and place top on shaker. Shake until well blended. Pour through a strainer into a the prepared martini glass, dust with a little nutmeg and serve! *You can find out if your liquors are vegan on Barnivore. Impressive! You should write a book, or better yet, open a restaurant, I'll be your partner. Classy drinks, small plates, neighborhood atmostphere, Minneapolis needs this! What a perfectly festive drink! I could do with one of those right now to help with the gift wrapping....! It has been unseasonably warm, hasn't it? 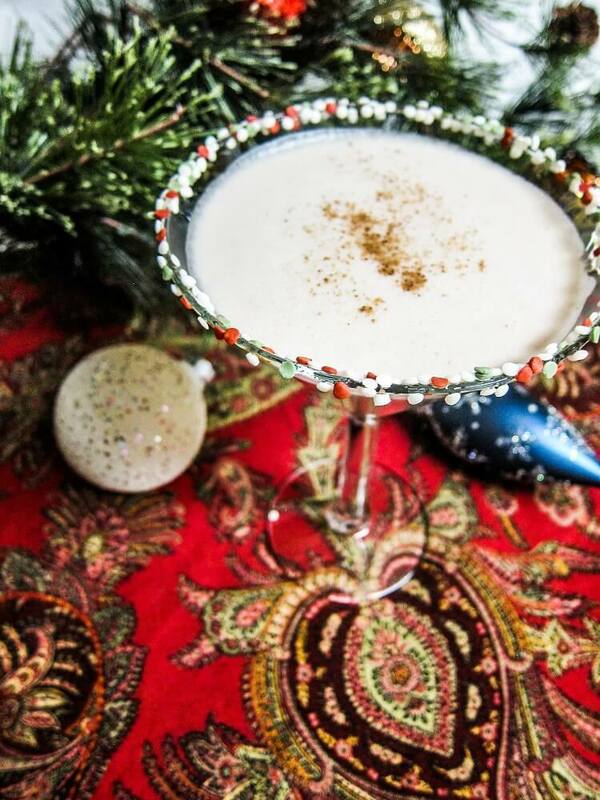 Although it might not look very Christmas-y outside, this drink sure looks festive! The drink is exactly where I want my white. Last year's winter did me in for a few years. And this is so much prettier than long-term snow! Very clever. Very sweet. Wishing you a joyful holiday week. So pretty with that candy rim on the glass--wishing you snow! I would send you some if I could. This snowy martini is lovely. Love those no-pariels on the rim. Also love the no egg. We don't see snow here in FL but I can pretend. Thanks for sharing this. Happy Holidays! Hope Santa brings you some snow this Christmas!! so festive! Love that it's diary free. 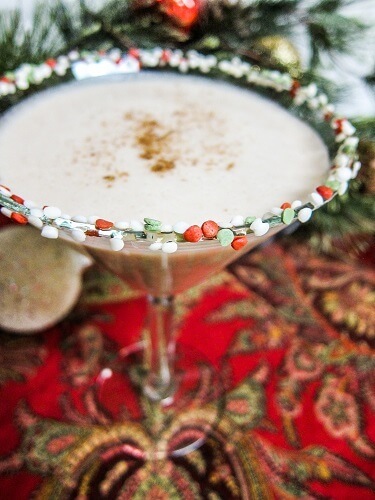 This drink looks so festive and delicious!! This looks AMAZING. Would it be okay with you if I feature your recipe in a roundup? I'd love to include a photo in the collage, and of course I'll link over to this post. Thank you :)! Of course you can, if you link back I never mind.